Takasu, a country Octopus…Man joins the crew. Where he came from or how he found out Wakasa was living in Tatsumi’s bathtub is not explained and I’m not even going to try. 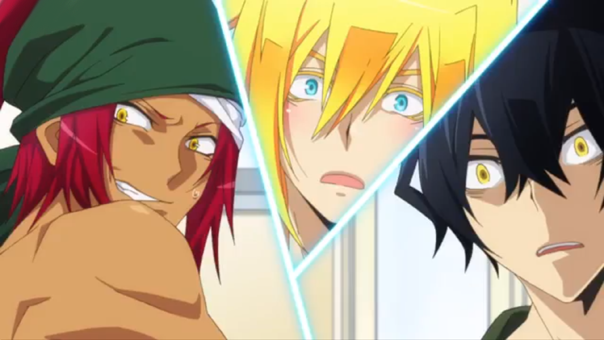 I mean, it doesn’t seem like Tatsumi lives too close to the river and, aside from a portable TV, Wakasa has no connection with the outside world! But don’t over think it! This is a 3:30 long show when you deduct the opening theme. We only have time for the jokes! I get the feeling though that he’s more clever than Wakasa too. Not just in technical things, but in planning. He knows there’s an order to things — an order to the events leading up to asking someone to stay in their bathtub. 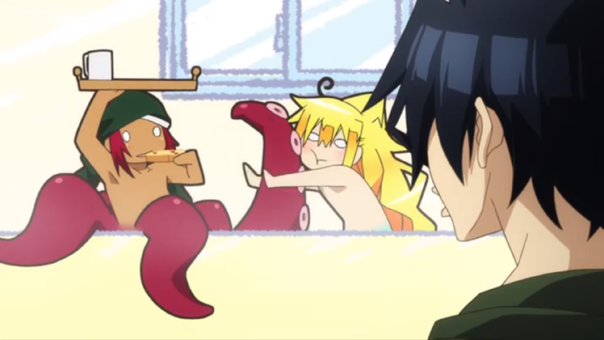 And hey, he even mooches Wakasa’s pizza! He definitely knows what he’s doing! Over all, the episode was was adorable…and kinda creepy. Concluding on an octopus massage, which was definitely arousing Tatsumi went a long way in that regards. It was very ‘happy ending.’ But with sucker popping noises. Ick? However, during the credits we learn that Octopi love small, dark spaces and Takasu climbs into Tatsumi’s washing machine. Uh, I guess each creature will have his or her own place? Orenchi no Furo Jijou is a weird show and it’s getting weirder. It’s also getting decidedly more BL too! I’m not sure how I feel about that yet…but for now, it’s harmless short fun and worth at least 2 laughs, which is way above the average laughs per minute!